Robert Hooke was born on July 18, 1635, at Freshwater on the Isle of Wight. Being a son to a clergyman who committed suicide by hanging in 1648, Hooke was able to combat the effects of becoming orphaned at an early age, including irregular schooling and emotional scaring. Hooke was educated mostly at home during his early years. But at the age of 13, he joined Westminster School and from there he was able to enter Oxford University, which was the only university where some of the best scientists from all over the world were working at that time. 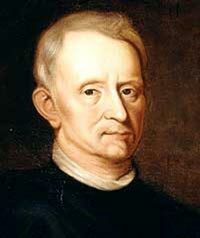 Hooke impressed a majority of them with his skills at designing and setting up experiments. In just a short time, Robert Boyle, the famous chemist, appointed him as his assistant. In 1662, Robert Hooke was named curator of experiments (responsible for demonstrating new experiments) to the newly formed Royal society of London. He later became a Professor of Geometry at Gresham College in London. During this time, Hooke had a set of rooms where he spent most of life until his death in London on March 3, 1703. Hooke’s reputation in the history of biology can be attributed to Micrographia, his first book published in 1665. Micrographia is still considered the world’s first comprehensive book with illustrations on microscopy. During his time, Hooke devised a compound microscope with an illumination system that he used in his demonstrations. He was able to observe several microscopic organisms including sponges, foraminifera, insects and bryozoans. Micrographia was Hooke’s accurate and detailed record of his observations. He created illustrations in the most magnificent manner using drawings, which is why the book was a bestseller during his day. However, some of his readers ridiculed him for spending so much of his time and money on such trifling pursuits. The most famous observation in the field of microscopy made by Robert Hooke was that of discovering plant cells by observing microscopic images of thin slices of cork. As a matter of fact, it was Hooke who came up with the term “cell” based on the boxlike nature of these cells that reminded him of the cells of a monastery. In 1678, Hooke helped the Society of London successfully confirm a report written by Leeuwenhoek about bacteria and protozoa, referred to as little animals by then. During this time, Hooke noted that his compound microscope was not as effective as Leeuwenhoek’s simple microscopes that gave clearer images even though he found them difficult to use. In the early 17th century, many hypotheses had been proposed by a number of scientists regarding the origin of fossils. For instance, Aristotle proposed that fossils were formed and grew within the earth. However, Hooke became the first scientist to examine fossils using a microscope. He observed that there were some close similarities in the structure of fossils and that of petrified wood and also the structure of living wood and that of living mollusk. As a result, Hooke successfully managed to convince scientists that the fossils were the remains of plants or animals that existed in past geological ages.